Science's Less Accurate Grandmother: Review: Transformers: Lost Light: Dissolution by James Roberts, Jack Lawrence, et al. 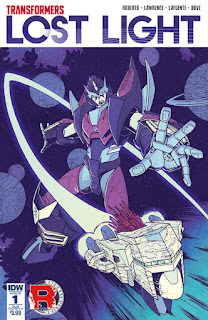 Review: Transformers: Lost Light: Dissolution by James Roberts, Jack Lawrence, et al. 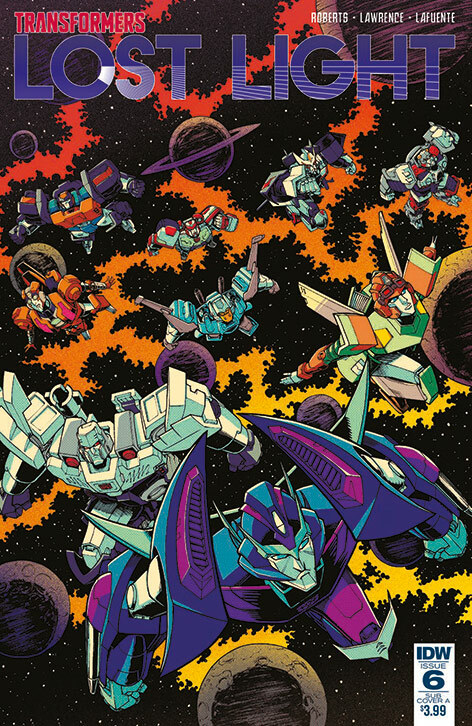 Lost Light picks up shortly after volume 10 of More than Meets the Eye, where various members of the Lost Light crew were stranded on the Necroworld after a ferocious battle with the Decepticon Justice Division... and then the planet exploded. Well, it turns out that the planet did not explode, but was instead shunted into an alternate universe, one created during the time travel shenanigans of volume 7. In this timeline, there is no Megatron, meaning that the Great War never happened... but instead the totalitarian Functionist Council eventually overthrew the Senate, turning Cybertron into an isolationist dystopia. "Team Rodimus" teleports to Cybertron only to find they're in this alternate world, and of course things go south quickly once they arrive. 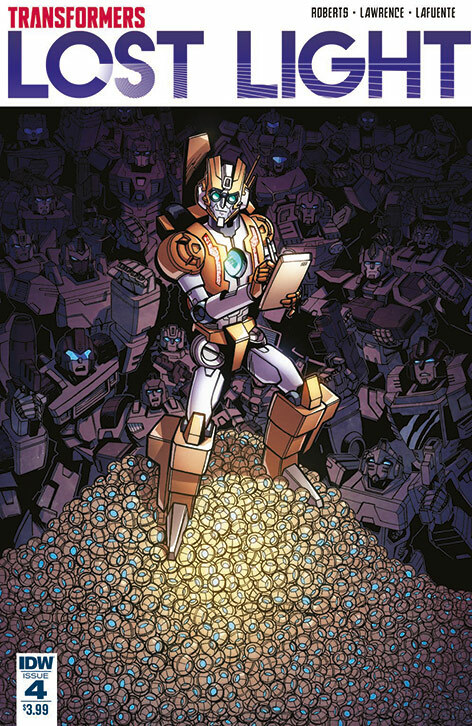 A big part of the story resolves around Rung's apparent uselessness. Because no one know what Rung's alternate mode is for, he's an ideological thorn in the side of Functionists, who preach that every Cybertronian has one purpose and one purpose only. When Team Rodimus arrives on Cybertron, the Functionist Council claims they've finally figured out what Rung is for. To be honest, I didn't always follow this stuff, but the whole thing climaxes with a giant-sized Rung battling a moon, so I think it's pretty valid to say it worked for the awesomeness, and that's all I really require. 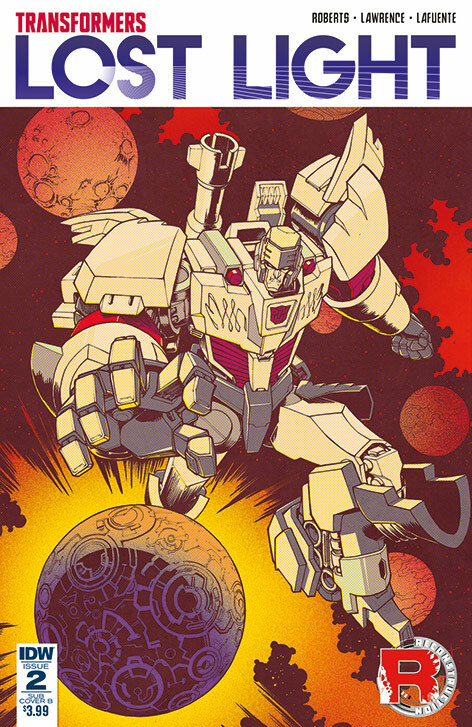 The real heart of the story in the Functionist universe is Megatron, still attempting to live up to his vow of pacifism, but now trapped in the horrors of a universe where he didn't start a war. At the end of the story, Megatron stays behind to lead the resistance against the Functionists. Megatron doesn't want to, though, showing the extent to which his time on the Lost Light really has changed him. He tells his friend Terminus, "If I stayed behind-- if I went back on my word-- I wouldn't be the person you think I am. And the person you think I am... that's the person I want to be." Terminus is someone Megatron hasn't seen since before the war, someone who never knew Megatron the monster. Terminus tricks Megatron into staying behind on the Functionist Cybertron; when Terminus claims Team Rodimus purposefully left Megatron behind, saying "They've given you a second chance," Megatron replies, "They'd already done that." 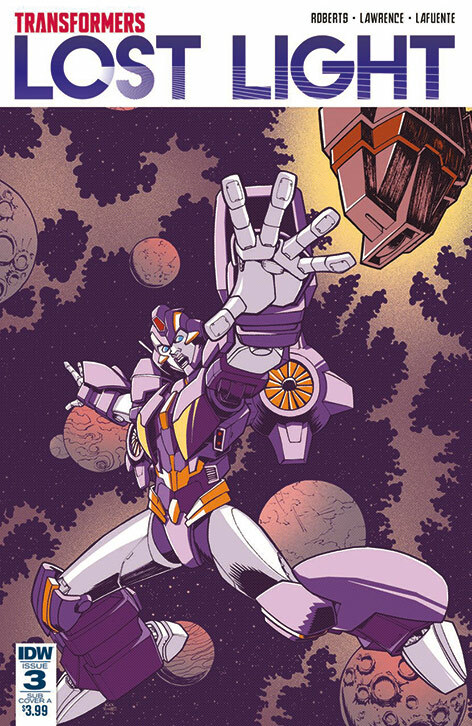 I was a Megatron-skeptic when he was introduced to More than Meets the Eye back in volume 6, but Dissolution shows how well he'd integrated himself into the series. I got chills with the line above, and in an earlier sequence, where Megatron expounds his new Autobot philosophy: "The opposite of Functionism isn't lack of Functionism. The opposite of Functionism is choice. It's about doing what you want-- regardless of what you were born to do, or what you're told to do, or what society expects you to do. No one can decide how to live your life except you." The second-last page, with Megatron lecturing to his new followers, is charming ("Peace through empathy. "); the final page, where it seems like this might be the one reality where Megatron and Orion Pax can be friends, is heart-warming. This was a satisfying end to the Megatron story. If he had ended up acquitted for his crimes because of a technicality like he'd originally planned, that would have beggared belief. But as told here, he genuinely comes around to the Autobot philosophy, and then is given an opportunity to put it into action. But I also like the tragedy that several of the Lost Light crew, in particular Rodimus and Ultra Magnus, end the storyline convinced Megatron never really did change, and was playing them the entire time. (Rodimus because of his own ego; Ultra Magnus because he can't stand ambiguity.) What was done with Megatron in season 2 of More than Meets the Eye and Dissolution shows the validity of IDW's approach to the Transformers universe. These are the stories you could only tell outside of the usual straightjacket of Autobots-versus-Decepticons, and they're all the better for it. 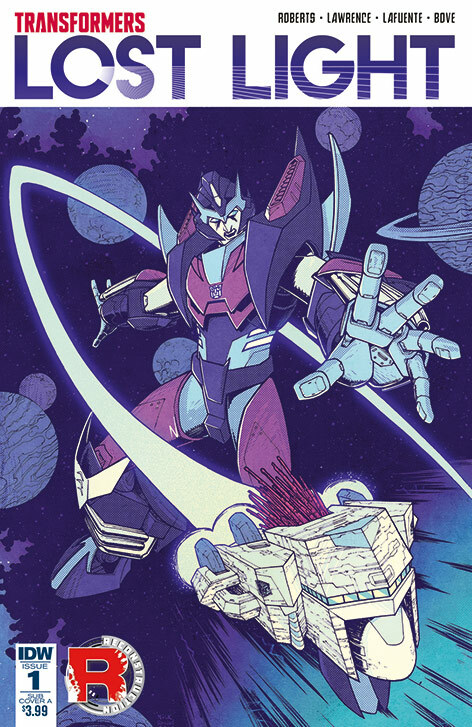 There's also a couple side plots about what's happening on Necroworld, which is mostly 1) the introduction of a new character, Anode, on whom I am currently agnostic, and 2) the deteriorating relationship Cyclonus and Tailgate. 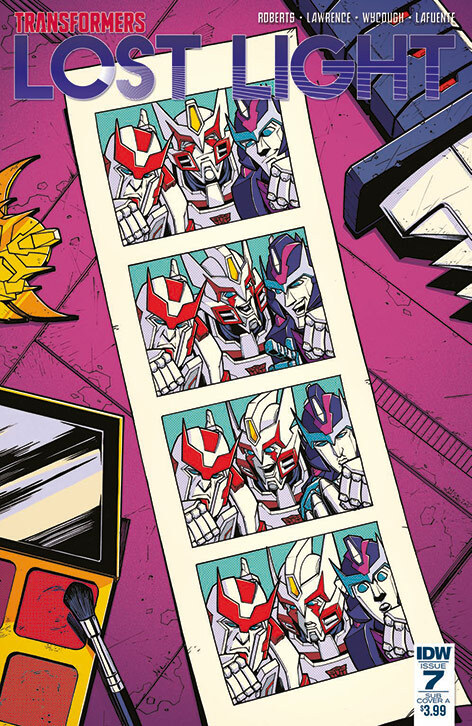 All the feels about the latter, of course; I look forward to seeing where both storylines go, as they're clearly more about setting up concepts for the run of Lost Light now that it's tied off some of the biggest plots of season 2 of More than Meets the Eye. Next Tuesday: Meanwhile, on Cybertron... Windblade must fight evil giant robot zombies Till All Are One! 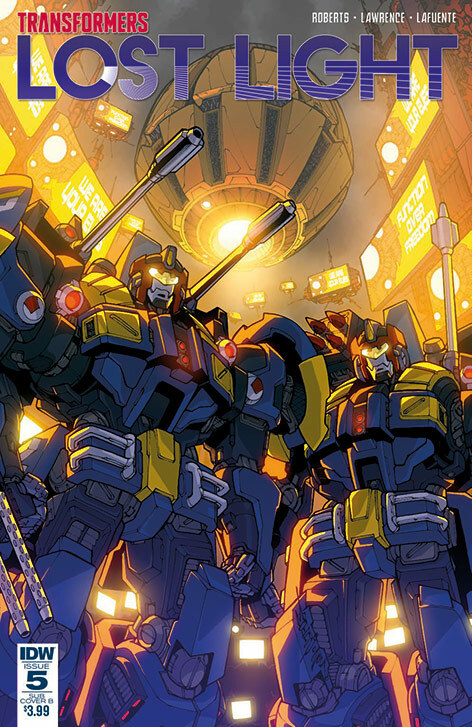 Dissolution originally appeared in issues #1-7 of Transformers: Lost Light (Dec. 2016–June 2017). The story was written by James Roberts, illustrated by Jack Lawrence, inked by John Wycough (#7), colored by Joana Lafuente (#1-7) and John-Paul Bove (#1), lettered by Tom B. Long, and edited by Carlos Guzman.